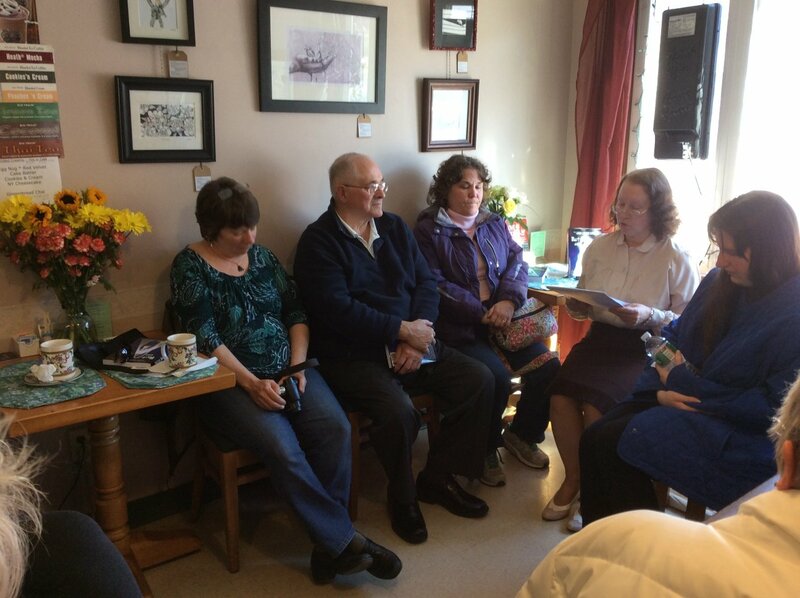 In between the raging blizzards of this spring, I was fortunate enough to be able to join some wonderful fellow mystery writers to promote our books and make connections with readers and neophyte writers. 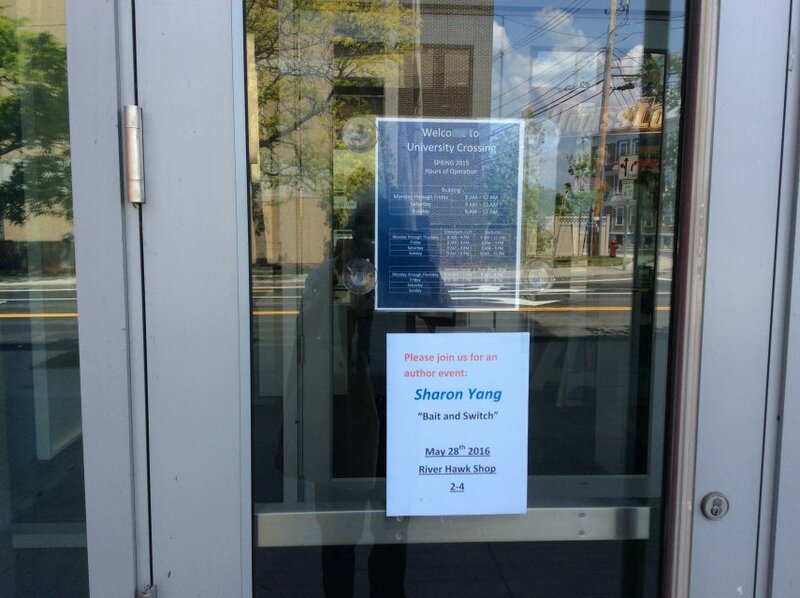 The first such adventure took Yang and I to the far north (of New York, anyway) to Ithaca and Buffalo Street Books. 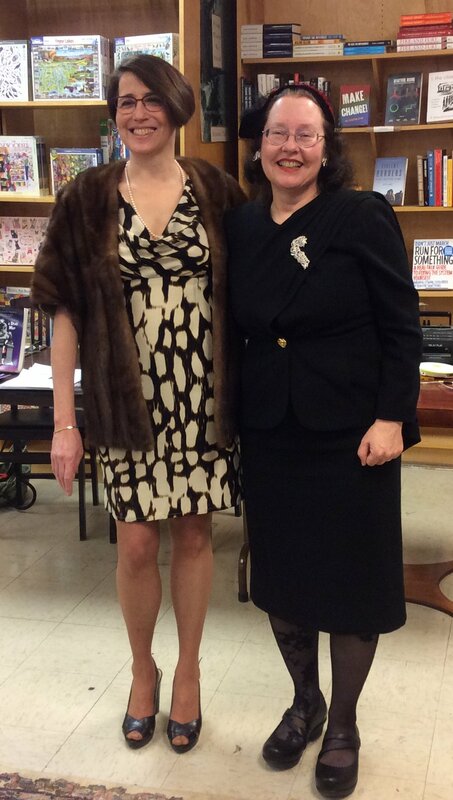 Here, my friend Lisa Lieberman and I presented “An Evening of Noir,” where we not only talked about our books but about the noir films that inspired us! Lisa’s husband Tim created this gorgeous poster for our adventure. 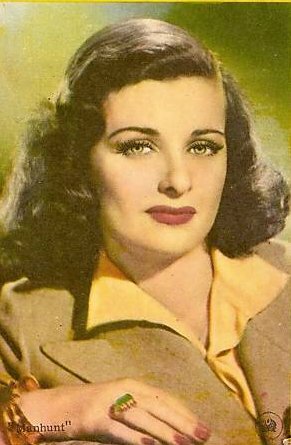 Note that it features my favorite femme fatale and/or smart-talking gal, Joan Bennett! Didn’t he do a superb job?! Lisa and I had a fun program. I had prepared a cd of background music to help create the mood of dark, mean streets; tough detectives; mysterious dames; and haunted pasts. Our playlist contained multiple versions of “Laura,” “Harlem Nocturne,” “Penny Blues,” “Drink Dirty Water,” “Peter Gunn,” and even Bruce Springsteen’s “I’m on Fire,” to name a few. And, of course, we dressed the parts, with Lisa’s swanky mink stole and slinky mystery-lady dress and my Claire Trevor femme fatale black suit with swag, complimented by red velvet and black feathered cap. Watch out Phil Marlow and Sam Spade! 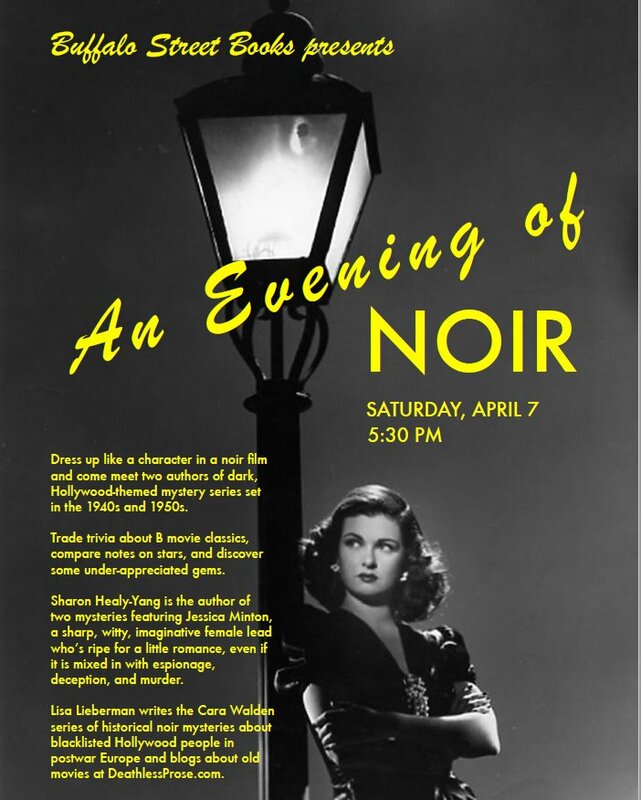 We had loads of fun talking with our audience about the trademarks of film noir and how they influenced our novels, especially in terms of specific films. Lisa detailed how her experiences in Hungary and the film The Third Man inspired the tense and dark atmosphere and tight plot twists of her Burning Cold. 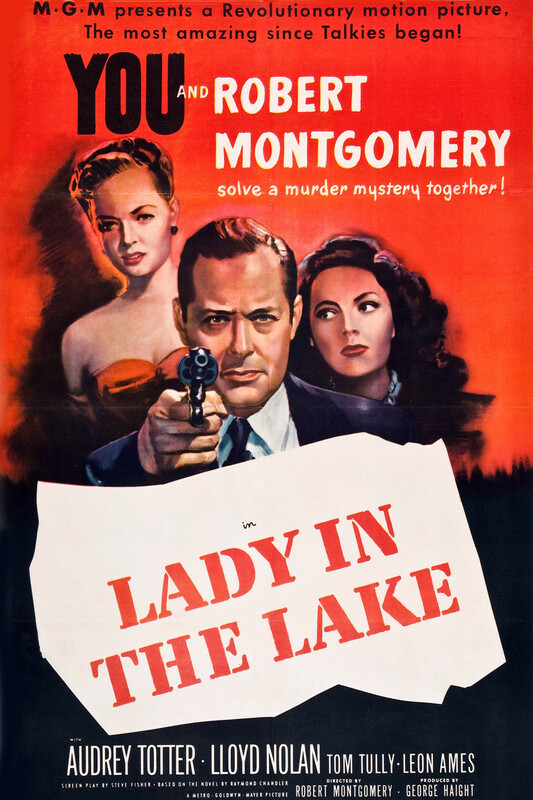 I shared how the wit, surprising reversals, and slippery characters in films like The Scar; Murder, My Sweet; and Double Indemnity shaped the latest adventures of Jessica Minton in Letter from a Dead Man. 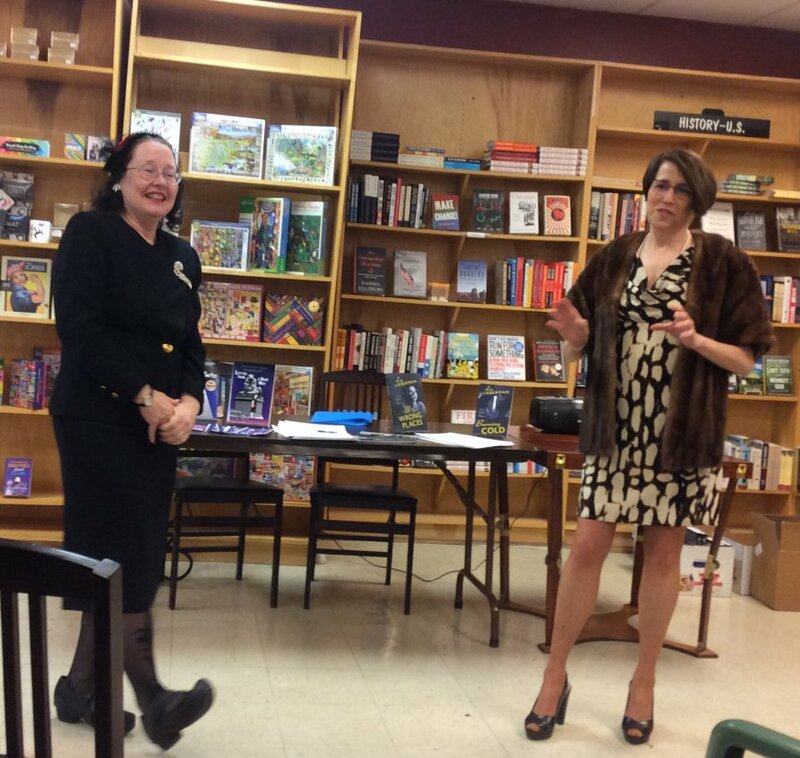 And both us ladies of noir had a great time sharing trivia and background about the filmmakers and writers of our favorite noir films with our audience. We had such a wonderful time, we’re thinking of adding film clips and “taking our act on the road”! 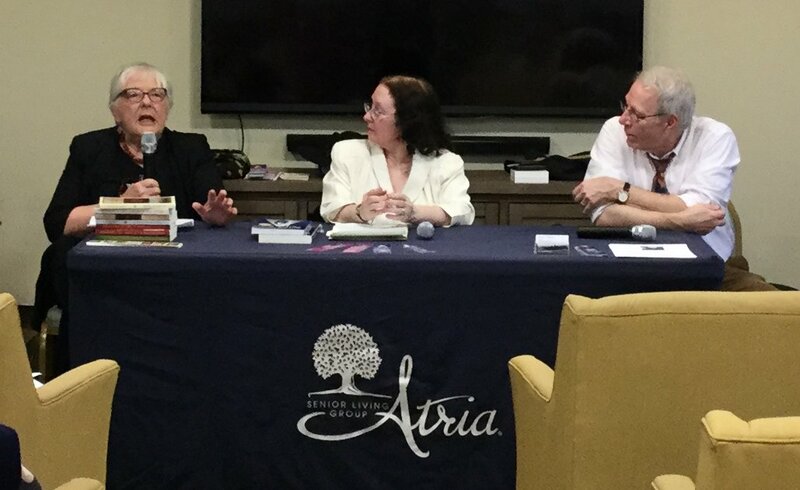 My other recent appearance was on a delightful panel, with an equally delightful name: “Stealing from the Dead.” This Sisters-in-Crime Panel took place at Atria Bay in Barrington, RI. 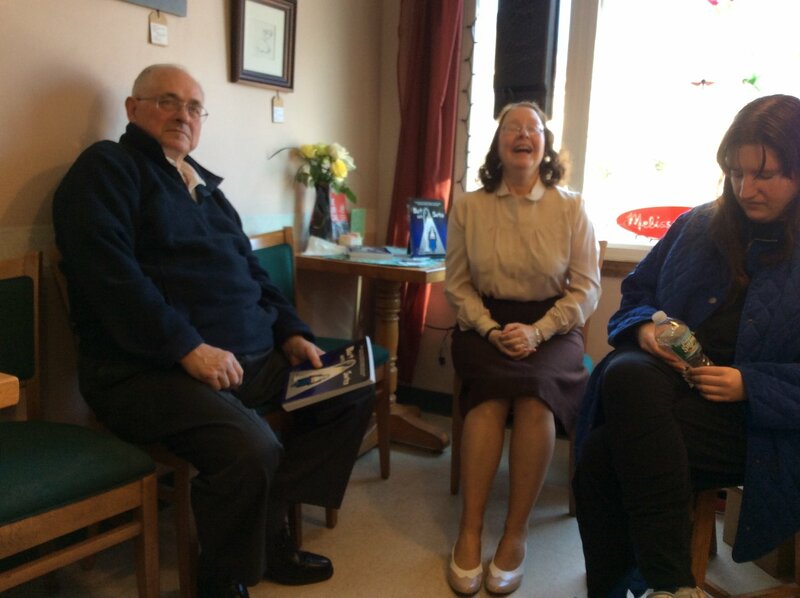 I was pleased to join Frances MCNamara and Steve Liskow for a fun presentation at the community. 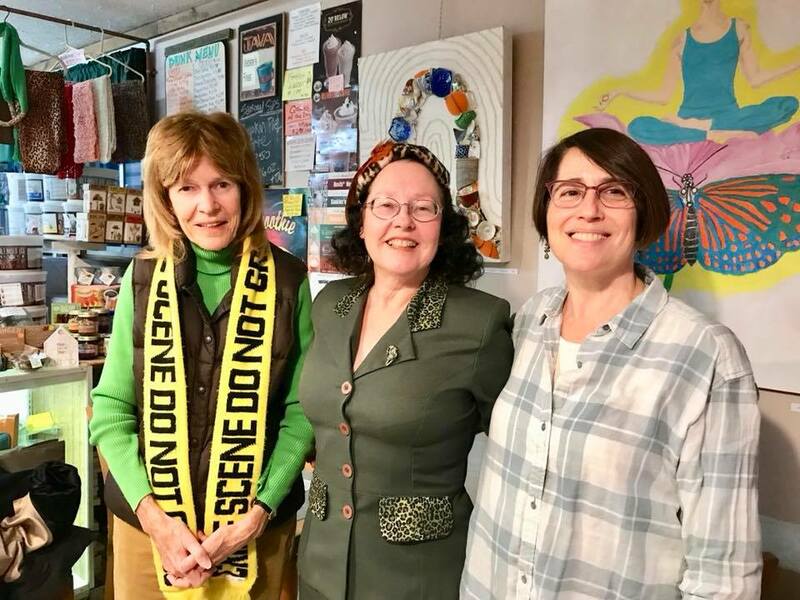 Both writers have fascinating books, with Frances’s latest series set in early 20th century Chicago and Steve’s in Connecticut and New York concerning the brutal reality of human trafficking. Do click on each of their names to check out their work in greater detail. You won’t be sorry! You can see from the picture on the left that I had a wonderful time. 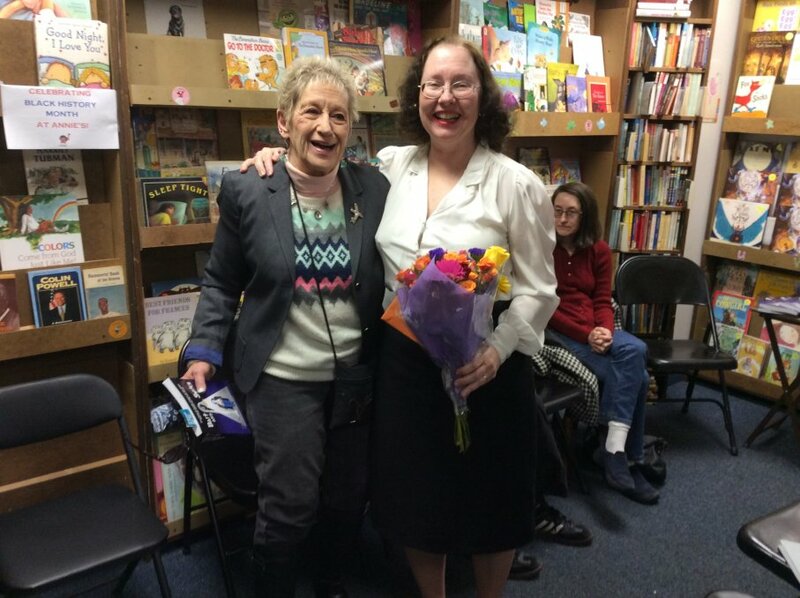 If you ever want to book a Sisters-In-Crime panel for your library, school, or other such group, you can contact Leslie Wheeler at the Speakers Bureau. 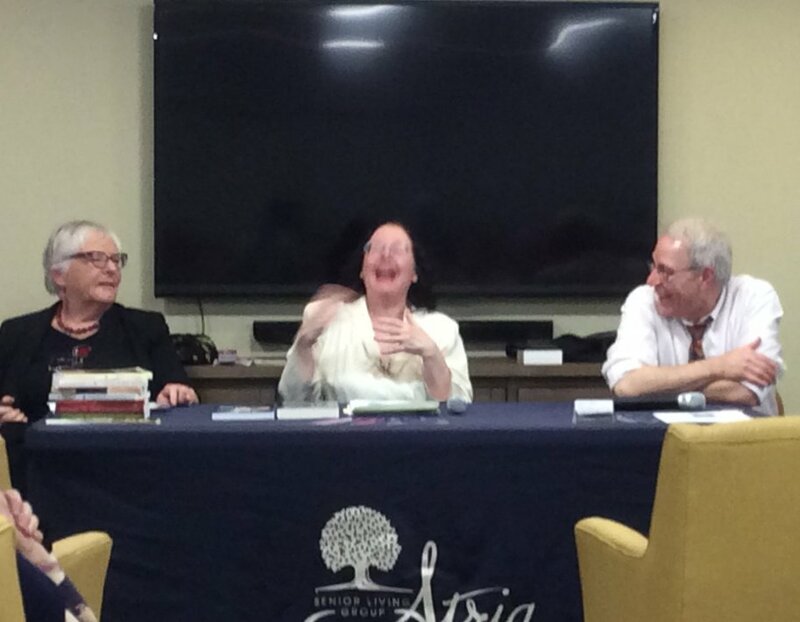 I also want to extend my thanks to Margaret Shand of Atria Bay for setting up the panel. the audience had intriguing questions and great comments for us. 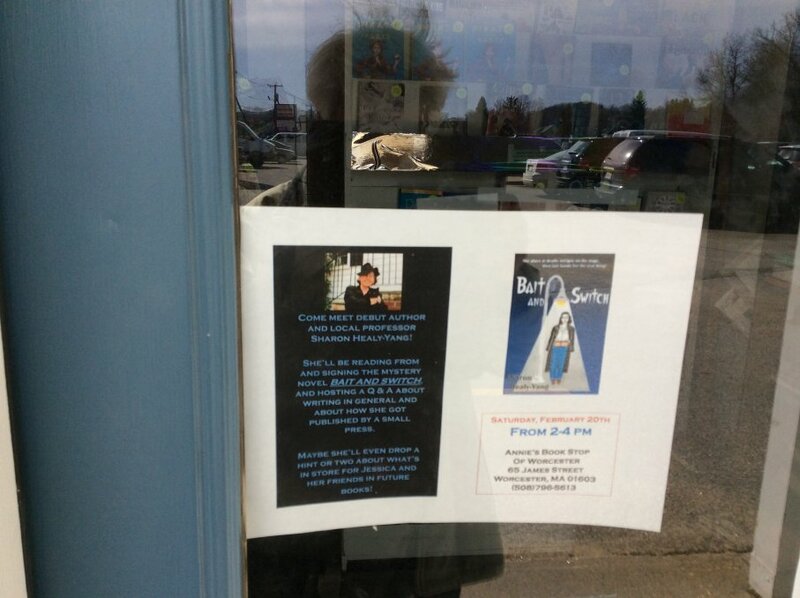 My thanks to Margaret for the photo at the top of the paragraph. Yang took what is probably the best shot of me, below. Monday, March 26th, I had the delightful pleasure of being the guest of honor at the Tea and Book Club held every last Monday (fall through spring) at Mrs. Bridges Pantry in Woodstock, Ct. It’s an exciting experience, where I join the book club for an evening of tasty comestibles and tea, then get to talk to them and answer questions about my writing – as well as sell some books! For good luck, I wore a beautiful navy and grey two-tone suit that Yang made for me, based on a pattern he created from a vintage outfit. 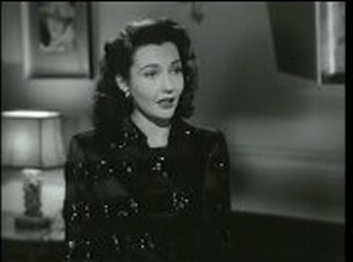 Of course, I couldn’t talk about my smart-talking gal, Jessica Minton, without wearing a pin that had once belonged to one of the original smart-talking gals, Joan Bennett! 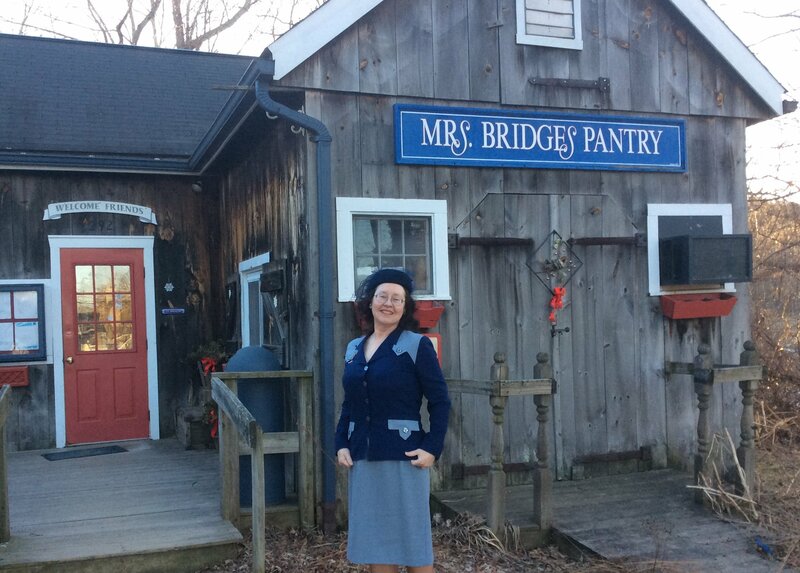 Mrs. Bridges is set in beautiful rural Connecticut, just over the border from Massachusetts. The tea room is in a rustic wooden building. Every day of the week but Tuesday, you can journey there for lunch, dessert, and/or afternoon tea. They have a wide selection of black, green, red, and herbal teas. In fact, they are a major supplier for me! I highly recommend you visit, as I and my husband or I and my girlfriends frequently do. The people there are so friendly and fun, you’ll feel as if you are back with chums in no time. 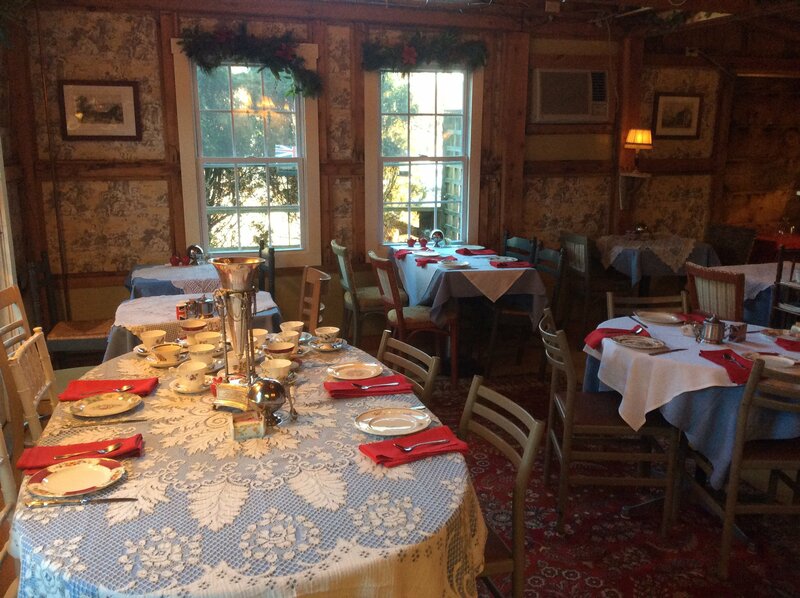 As you can see in the layout for the evening’s tea, there is a homey, lovely dining room. 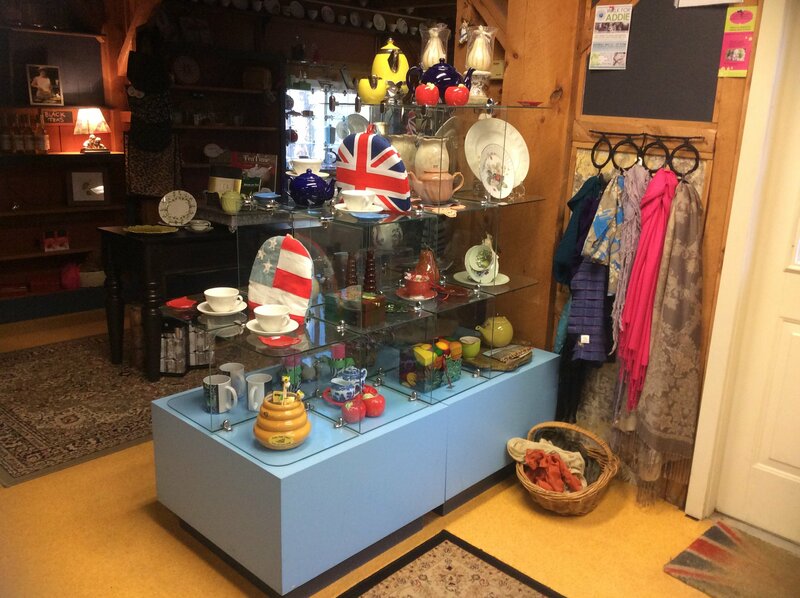 Further, you can find on the other side of the building all kinds of teas, china, and tea-related items for sale – including Bait and Switch and Letter from a Dead Man, the perfect accompaniment to a nice cuppa! 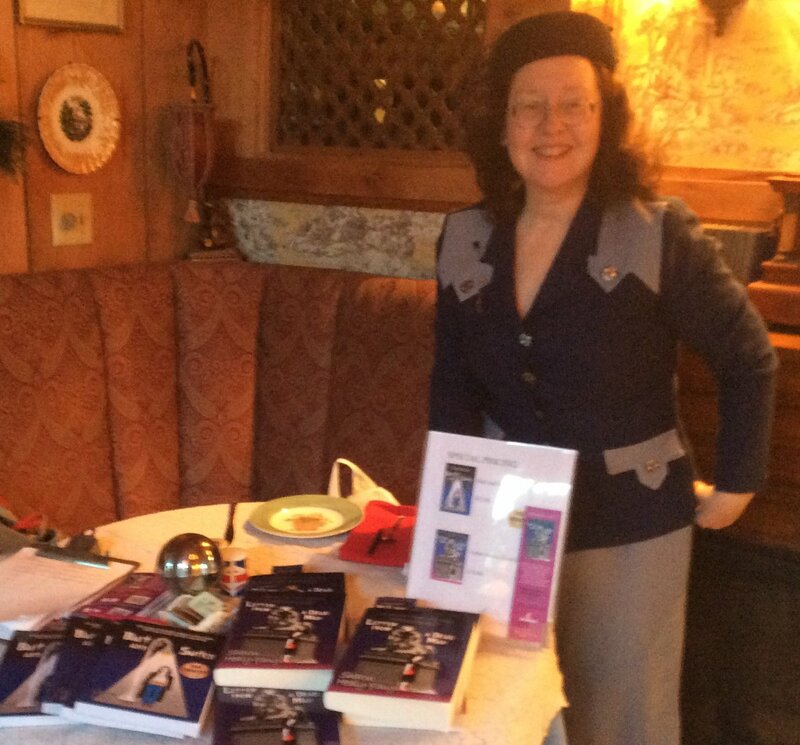 I had a wonderful time talking to the regulars in the club about my love of mysteries from the golden age, both on the page and on the screen, and the cinematic inspirations for many of the characters in my novels. It was also fun to talk about how evocative settings don’t just inspire a writer; they can drive you to use that place creatively. 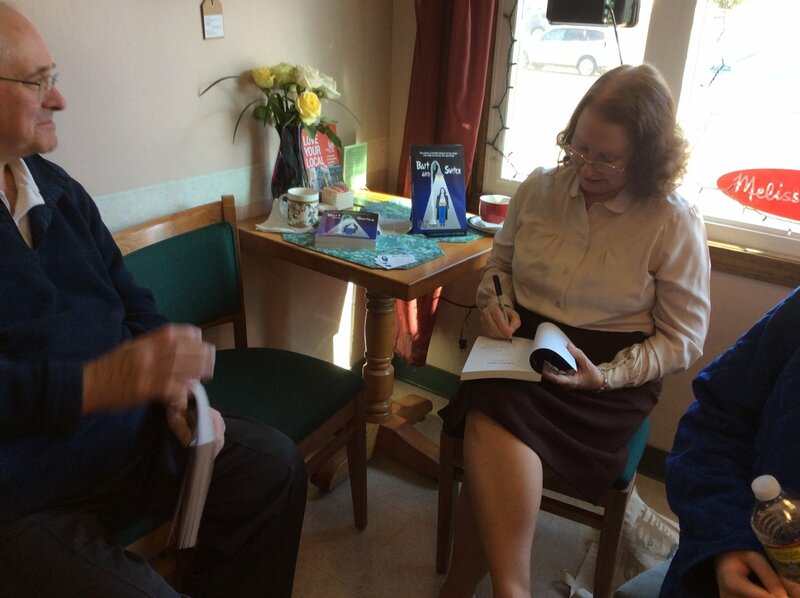 The folks had stimulating questions about how I found time to work, did I write by the seat-of-my-pants or did I have a fully formed plot at the start, how long it took me to complete work on a novel, or how I researched locations and events. In answer to that last point, I had fun telling them about going to New York City to test out one of Jessica’s hair-raising escapes, myself. You’ll have to read Letter from a Dead Man to find out how it works out. 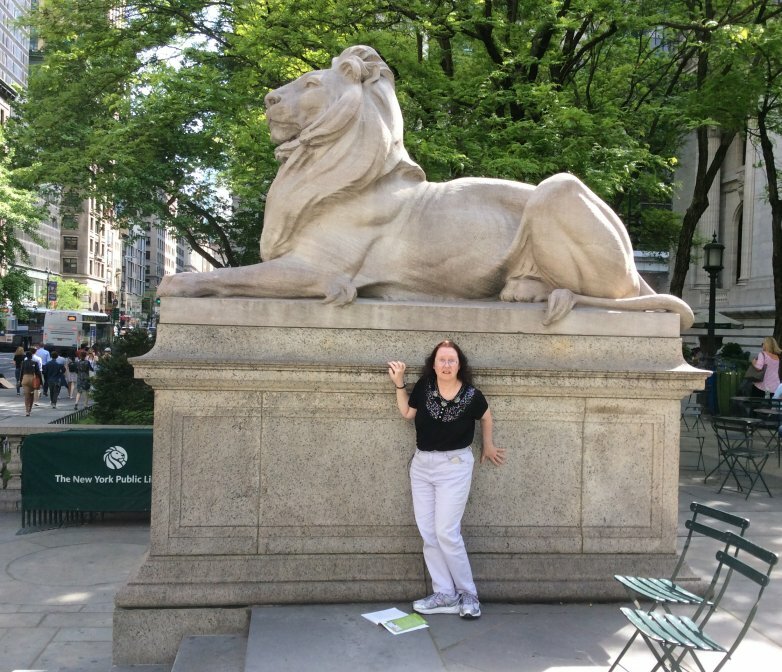 Here’s a hint – it involves the lions in front of the New York Public Library. And speaking of Patience and Fortitude (the lions’ names), it turns out that a brother and sister there that night were descended from the man who ran the business charged with moving them to the library. Small and intriguing world, isn’t it? 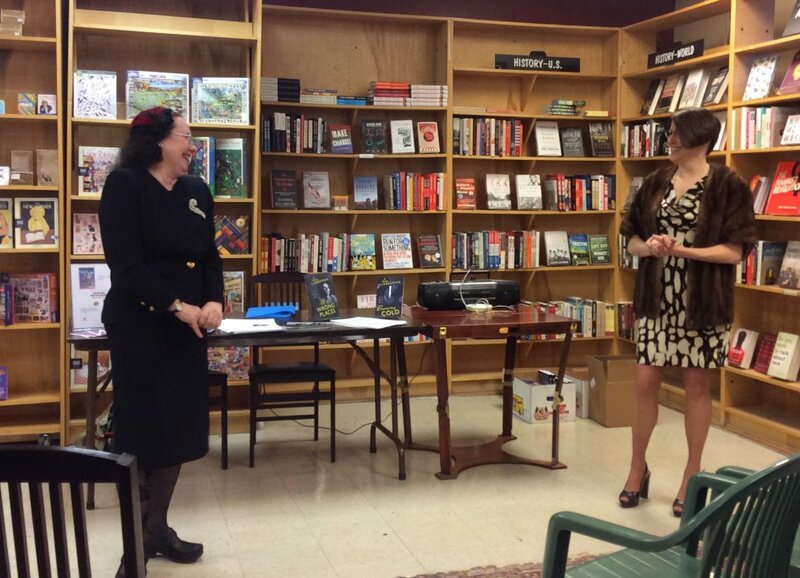 It was fun to renew old acquaintances and make new friends amongst the book club folks that evening. 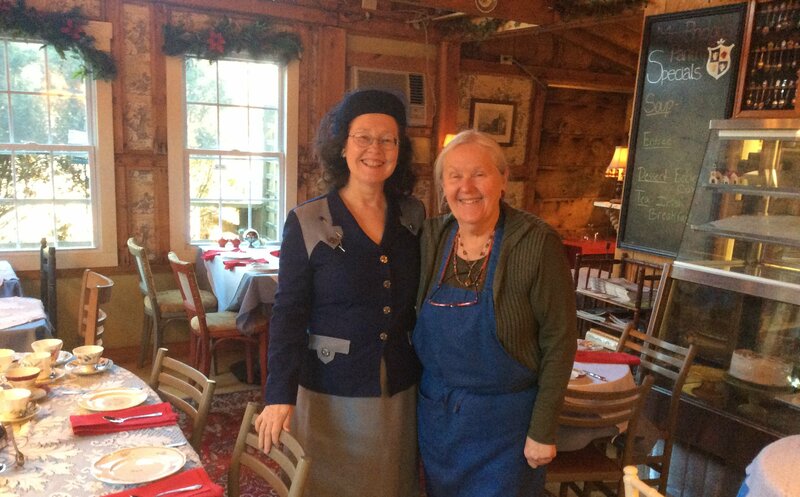 It was also lovely to work with Hope, who runs the Tea/Book Club, and Amber, who was our waitperson for the evening – constantly and patiently supplying me with Irish Breakfast tea! I have a picture here of Hope and I together, but I forgot to get one of Amber. Shame on me! If you live in the area, check out the Tea/Book Club. 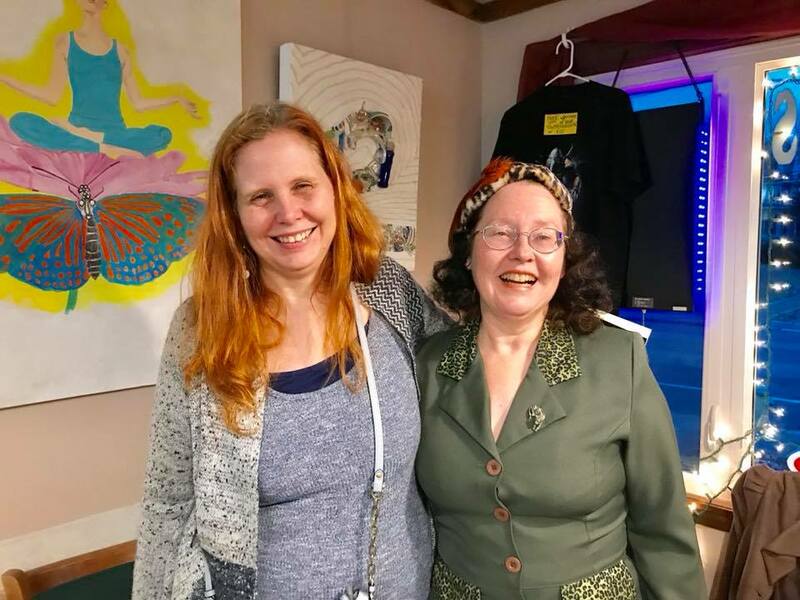 For $15.00 you have a delicious evening (homemade soup, tea sandwiches, dessert with homemade jam, and unlimited tea), as well as the chance to meet and talk with interesting authors (like me!). 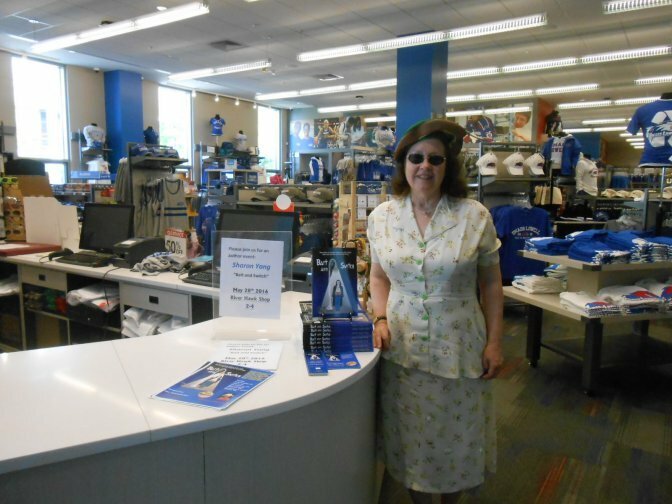 Or just stop by Mrs. Bridges for lunch or an afternoon snack – and pick up a copy of Bait and Switch or Letter from a Dead Man while you’re there! Dusty would approve! 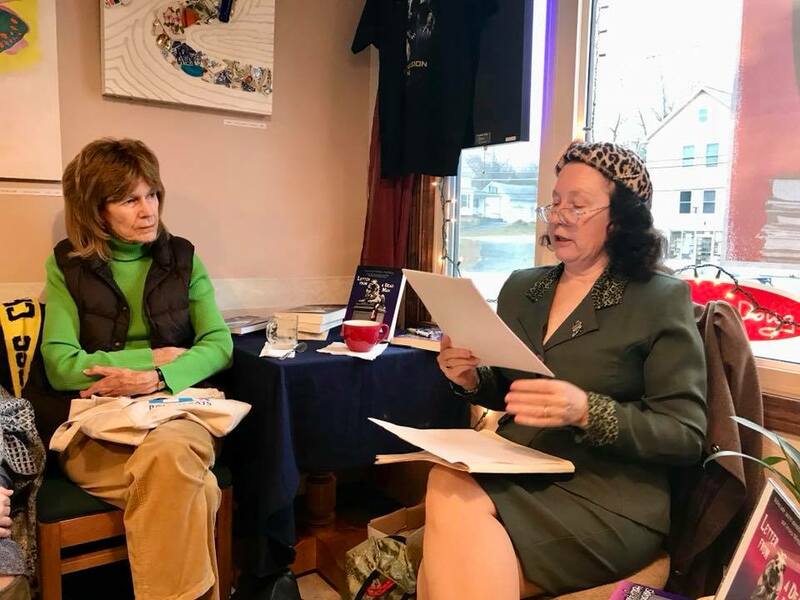 Saturday, 11/18/17, Letter from a Dead Man got its official launch at The Booklovers’ Gourmet in Webster. What a wonderful experience! There was a nice turnout of friends, colleagues from school, fellow writers, students from WSU, and even new people I didn’t know yet. 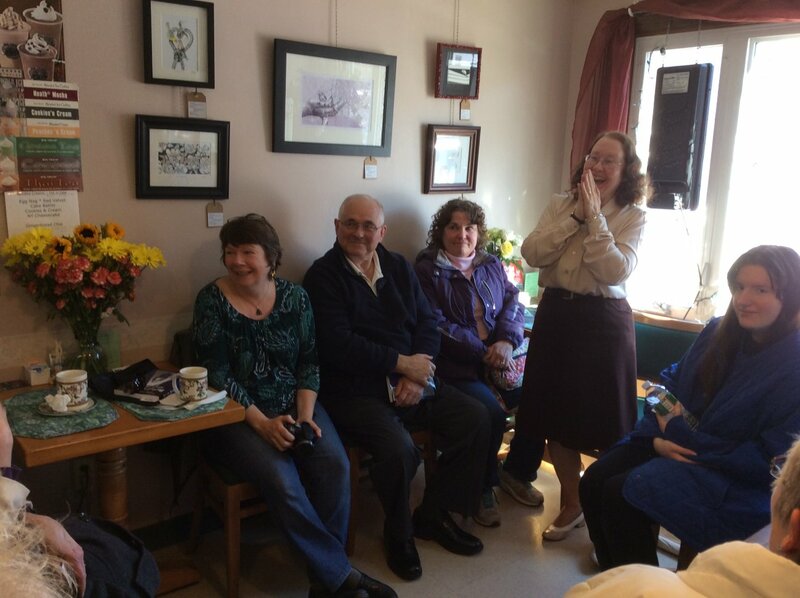 As usual, Deb Horan had the room set up beautifully, and we all had the opportunity to partake of some yummy comestibles and beverages. I smoothed out my vocal cords with a tasty pumpkin latte – ’tis the season! We all started off by chatting about writing, teaching, and the inspirations for my 1940s-style mysteries, especially how I like to cast my characters as favorite actors from the era: Joan Bennett and Rosalind Russell as the smart-talking Minton sisters, Lloyd Nolan as the tough-guy henchman, and Claire Trevor as the ultimate femme fatale, for example. Interspersed with these points, I did some readings, which I’m happy to report, people found tense and intriguing. I gave them a scene where sisters Jessica and Liz have to face off against the threats of the femme fatale’s menacing torpedo – without giving away what mysterious object he held in his hand that would prove a vital pivot for the plot. I later read from the scene where Jessica had to flee and seek refuge from deadly pursuers behind one of the lions in front of the New York Public Library. This led to a discussion of Dead Man’s cover and the fun story where I went to New York with Yang to “test” out the scene of Jessica’s flight. 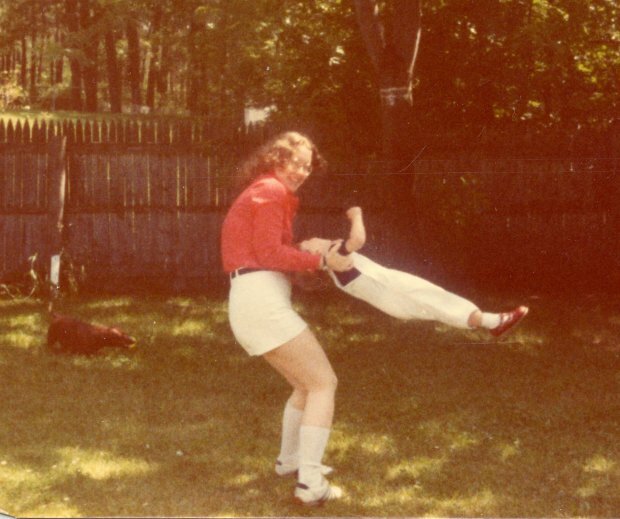 I was fortunate that two of my Sisters In Crime, Lisa Lieberman and Leslie Wheeler, joined me. The three of us bounced questions and comments off one another to give the rest of the audience insights into the sources of our ideas, how we write (outliners or seat-of-our-pantsers), how we overcome writer’s block, and how good editors or writers/readers groups challenge and inspire us to overcome obstacles in the way of getting the right words on the page and those pages into print. 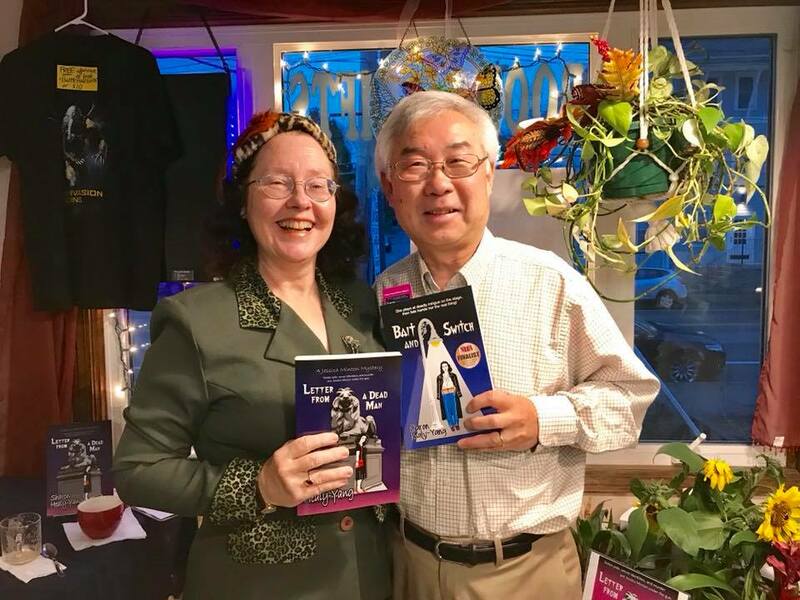 Speaking of reading/writing groups, one of the posse who keeps me on my toes, my friend Judy Jeon-Chapman, was able to join us. Not only has she given me great feedback, but there were days when she’d needle me every night to get her more chapters to calm the suspense I’d enkindled with my writing. So, as a reward, I worked her into the third story (yet to be published) as I was editing it! Several of these pictures even came from her. 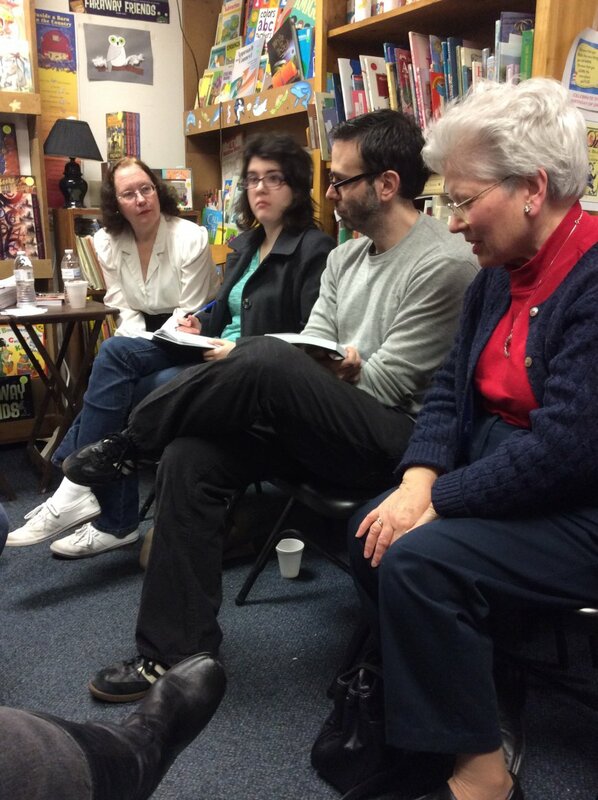 You can see how enthusiastic I am about talking writing here. I also love Leslie’s “Crime Scene” scarf! 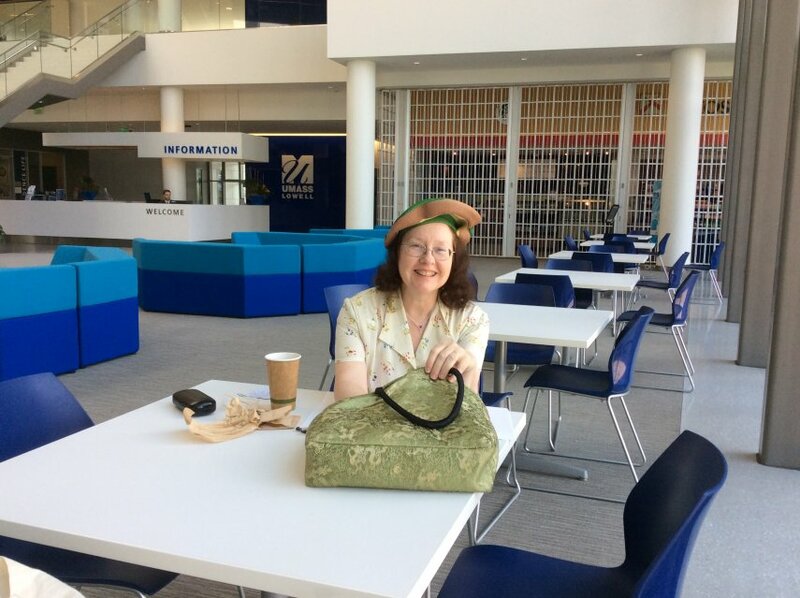 Maybe the best part of the day was getting to spend time with old friends and colleagues whom I hadn’t seen in a while, like Rini Kilcoyne and Jim Foley from Worcester State. I so much appreciate how these folks support me and the good friends and coworkers they have been over the years. I’m a lucky gal! Here’s a picture of my favorite supporter! Maybe I shouldn’t be charging him for the books? So, Christmas noir? The opening of a lively chorus caroling and holiday cheering over Christmas cards displaying the credits evokes holiday spirit, except there’s always just the slightest manic edge to their liveliness creating a noir frisson. Then the chorus ends in a startled drop as the last card slips away to reveal a gun. Click here for a Silver/Ursini commentary on the opening. You have holiday parties, mistletoe, presents that give away true intentions, mixed with a disappearing adulterous wife, her charmingly sleazy actor boyfriend, her sophisticated and two-faced husband, a high-class gold digger of an assistant publisher, a brutal and probably crooked cop, and a high strung mystery woman. 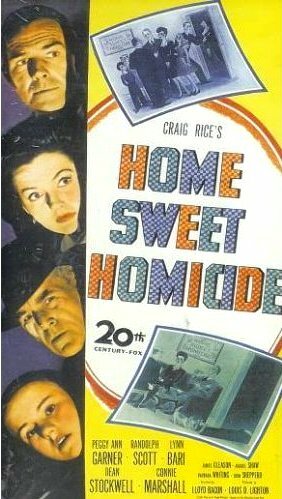 Leon Ames is at his most smarmy-charming as the husband, Audrey Totter is tart as a Granny Smith as the assistant, Lloyd Nolan is at his menacing and slightly psychotic best as the cop, and Jane Meadows is positively manic. I needed a sedative after five minutes of her. Bob Montgomery’s Philip Marlowe wasn’t bad, but he wasn’t my favorite. He was smart and wary, but he was also a little too full of himself – especially when putting down Audrey Totter’s publishing executive. Lloyd Nolan wasn’t the only one who wanted to slap him around. And speaking of Lloyd, the character he plays here went a long way to inspiring one of the characters in the sequel to Bait and Switch, which I’m polishing up to send to my publisher: Letter from a Dead Man. The plot’s a convoluted, dashing sleigh ride but it’s worth the trip. Have fun! Here’s a link to a trailer for the film. 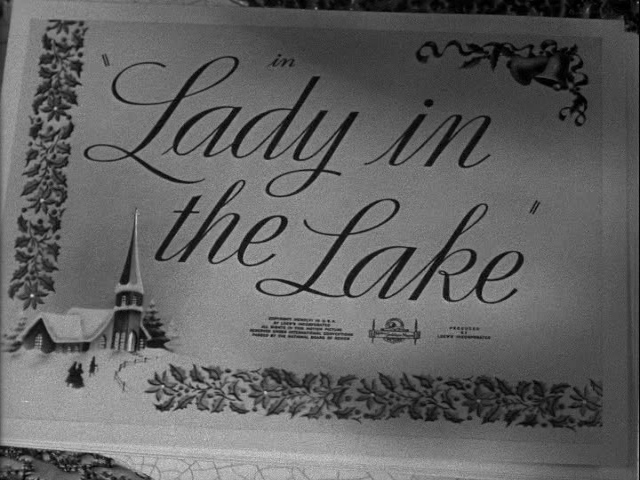 If I have time, I’ll try to review some other Christmas or Holiday noir, like Coverup, Lady on a Train, Repeat Performance, or The Thin Man Goes Home. Otherwise, there’s always next Christmas – with any luck! 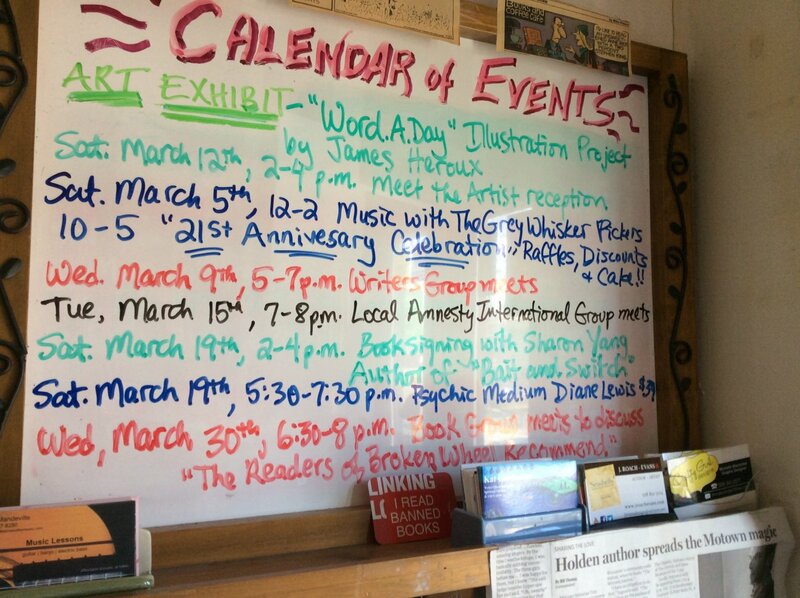 The Book Lover’s Gourmet is a little gem of a bookstore and cafe in Webster, MA. 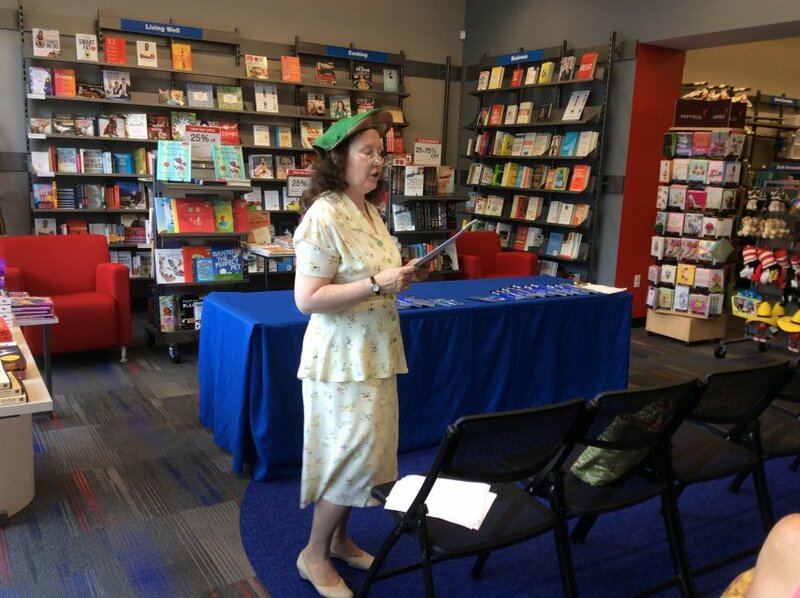 I was fortunate to do a reading and signing there on March 19th! There’s a lovely selection of books of all kinds, with an especially nice section of children’s books and another of local authors (including me!). Ah, the excitement of seeing your name and book title, well, not in lights – but at least in magic marker on the white board! There I am in turquoise, one of my favorite colors, third from the bottom. 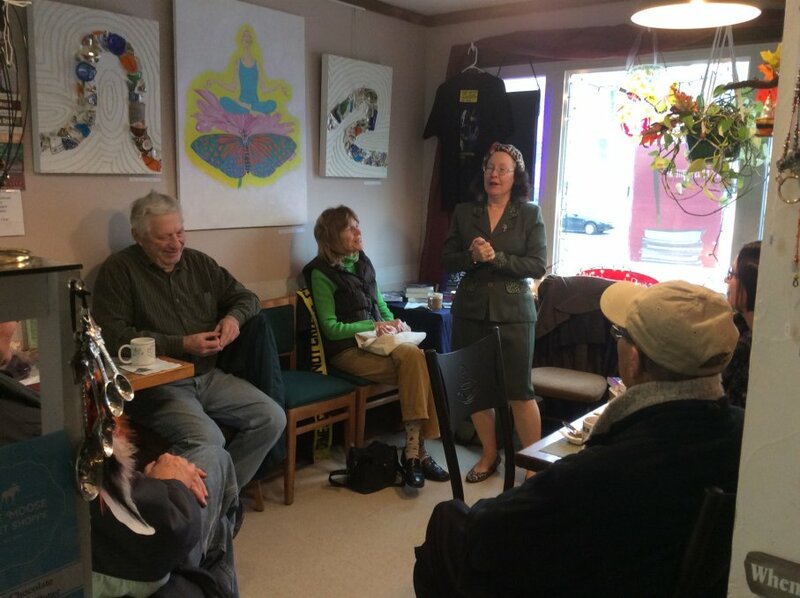 So, let’s get started, in the cozy little room where people usually sit and enjoy scrumptious pastries – or quiche if they’re more in the mood for savory. 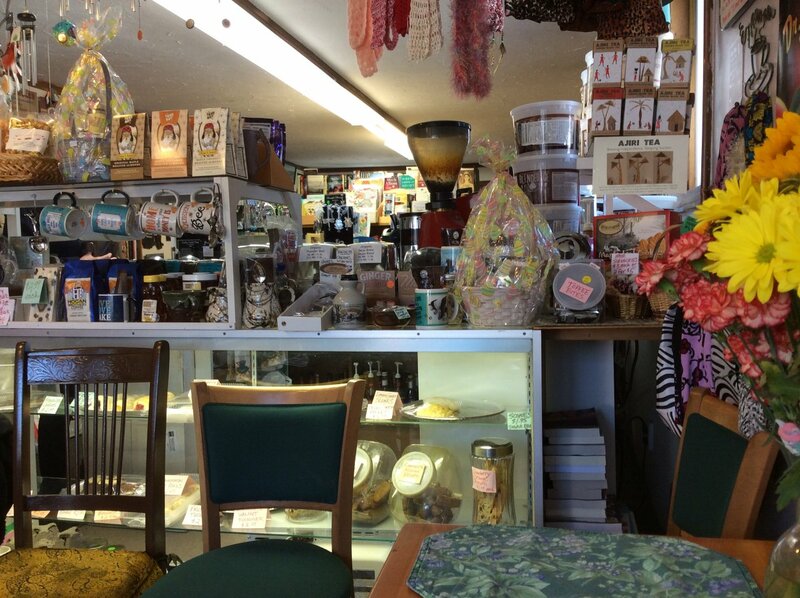 And don’t forget the coffee, chai, lattes, and cappuccino – mine’s right behind me in this picture. 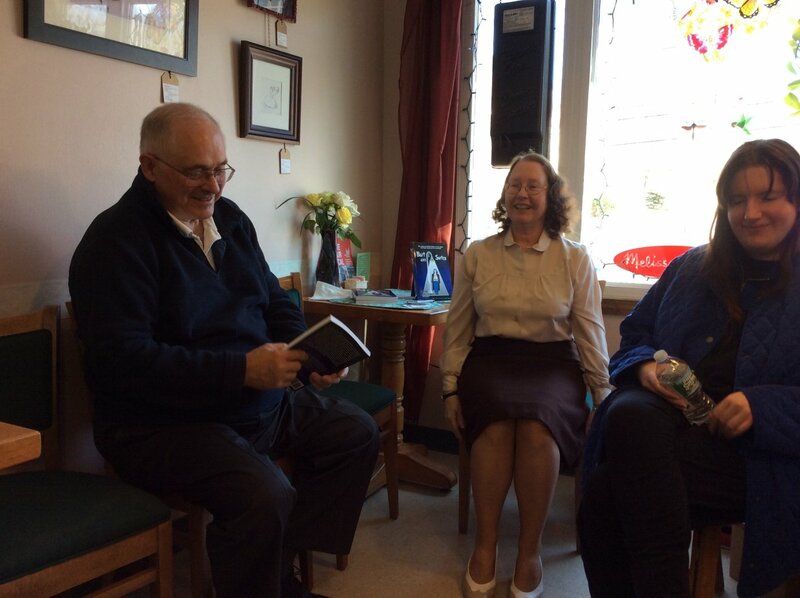 I must have said something profound, because Bill Graves (one of my sharpest students) is smiling and pondering, while another sharp cookie, Joanne Evans, is exchanging deep thoughts on the writing and publishing processes with me. You can tell it’s a profound conversation by the way we’re raising our mitts to make our points. I just wonder what brings that cat-that-ate-the-canary smile to Kathy Healey’s face. She’s probably thinking about finally being finished editing the Gothic Landscapes book – well almost finally. The conversation continues. Elizabeth Gaumond listens with rapt attention. I look reflective. So does Joanne – or has my reading put her to sleep? No, not the adventures of Jessica, Elizabeth, James, and Dusty! 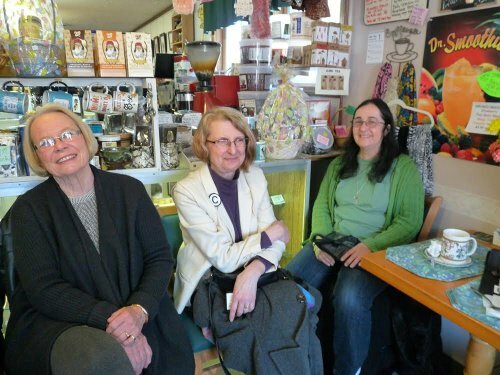 Meanwhile, across the room, Pam Graves, Barbara Ingrassia, and Kate Zebrowski seem to be enjoying the reading of Jessica Minton’s encounter with a mysterious stranger, his mysterious package, and a threatening chap who’s built along the “graceful” lines of a fireplug. Note the display case of goodies behind them. My husband Yang seems to be having a humorous time for himself with them and Cookie Gaumond (Elizabeth’s Mom). Maybe it was the line about Jessica fearing she might have to slug a G.I. for his Hershey bar. That’s not very patriotic of her! Barbara’s husband Tom gallantly rose to give up his seat for Cookie, so you don’t see him here. 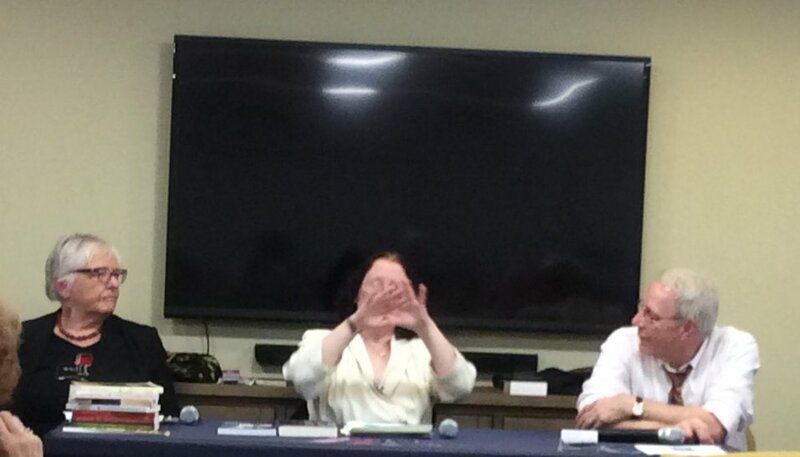 Something that was particularly fun and informative about this session was that we had two other authors present. 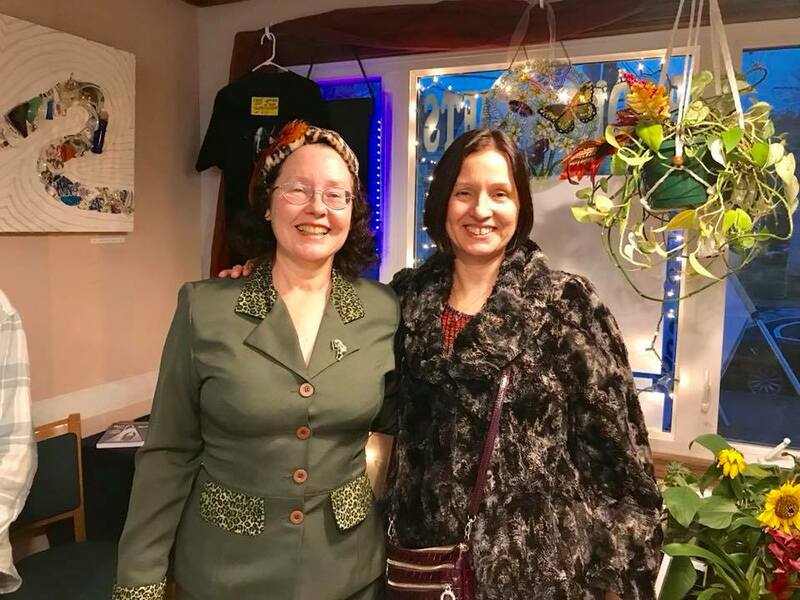 Joanne has authored and illustrated a marvelously beautiful, creative, informative and fun children’s book Seashells, Treasures from the Northeast Coast and graciously gifted me with a copy. I want to buy copies for the little kids in my life, now. Tom Ingrassia has written two books, himself. One, Reflections of a Love Supreme, is a wonderful book on the Motown story “through the eyes of the fans,” as the subheading explains. It’s filled with unique pictures from the fans and fascinating, fun background stories of fans and artists that don’t bog you down in all the depressing scandals but still give you an intriguing insight into the bonds between the people on both sides of the stage. One Door Closes is an enjoyable and helpful collection of essays by people who have dealt with disappointment and misfortune by redefining their lives creatively and joyously. 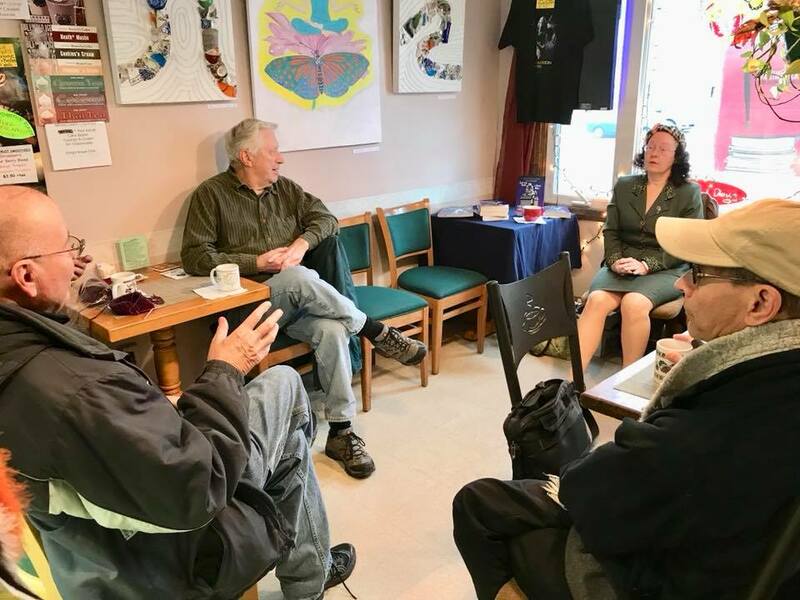 Then, there were also some neophyte writers with questions about writing, publishing, promoting – as well as legal aspects – so, we could talk about our experiences to help them with their questions on how to get their writing off their computers and into the hands of the public. Barbara had great advice on legal concerns. So, why am I excitedly on my feet here? I was delighted to find my friend and colleague, Jim Foley had come with his wife Lois and his son James. Yay! 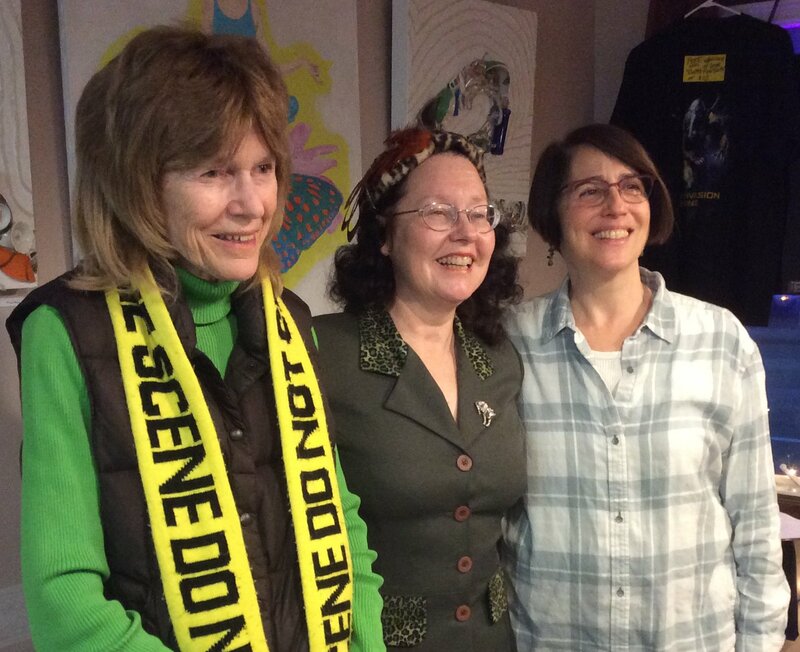 Fellow MST3K and Shakespeare and music fans! How can things go wrong?! 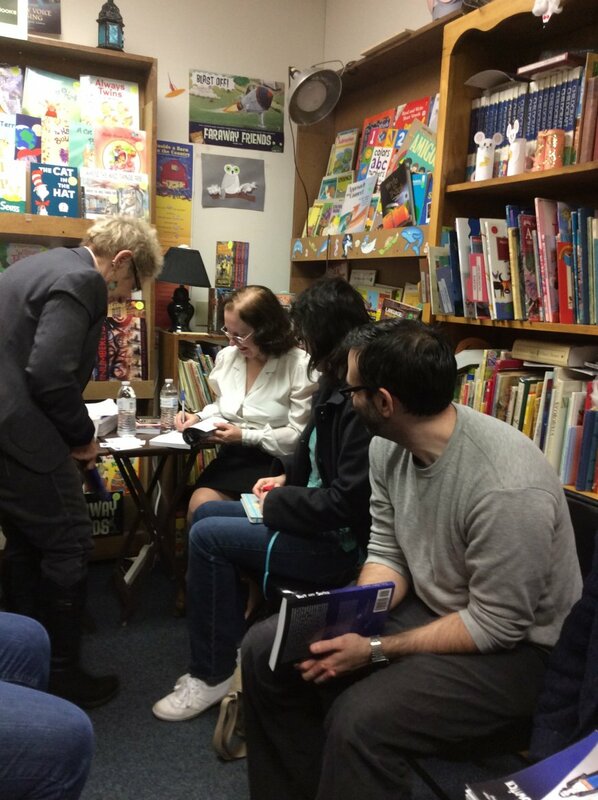 The day draws to a close, and I get to sign books for my delighted fans – and, no, students attending did not have to buy a book to pass my classes. Bill certainly seems pleased with whatever I wrote. Elizabeth looks pretty cheery, too! Well, I don’t know what cracked me up, but it must have been pretty good. Someone must have quoted a quip from those Smart-Talking Gals Jessica Minton and her sister Elizabeth Hennessey. Or maybe someone asked me if I was going to pick up the coffee and pastry tab for the whole crew? Anyway, this was a lovely gathering: old friends, new ones, all mixing together and either renewing old ties or forging new ones. That might be what I love best about these signings. 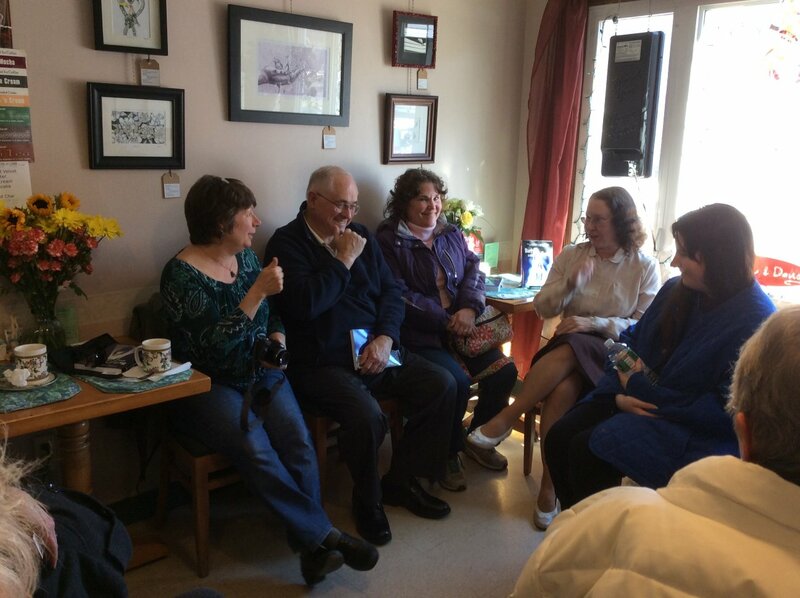 They’re like parties where you catch up with people, meet new ones, and share dreams and ideas – and, of course, people buy my book. 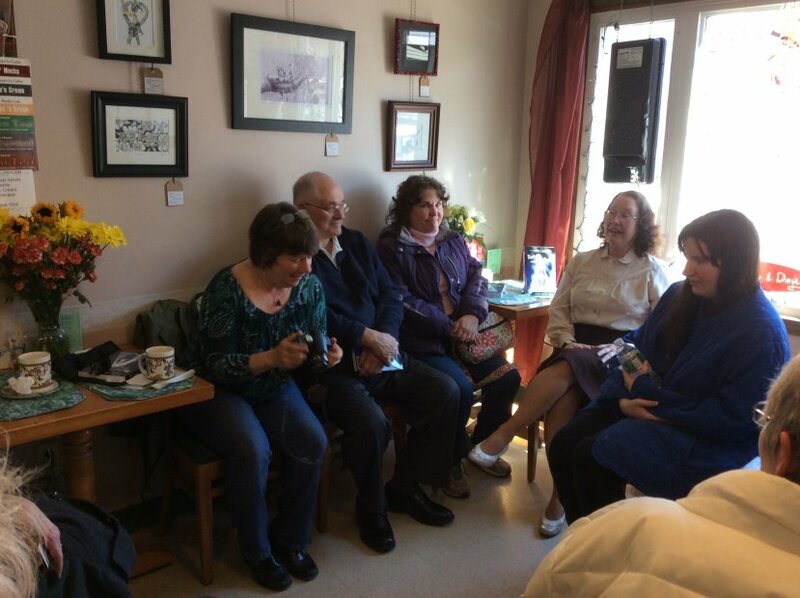 And here’s one last look at that luscious array of comestibles that Debra Horan serves up with nifty book chasers in cozy surroundings. The Book Lover’s Gourmet is a great reason to pass up Amazon so you can enjoy the warmth of a beautifully decorated store with real people. And Bait and Switch is definitely on sale there, so hurry down, buy a copy, and sit down with something tasty and refreshing in a sunlit room to read! Save a spot in the sun for Dusty! 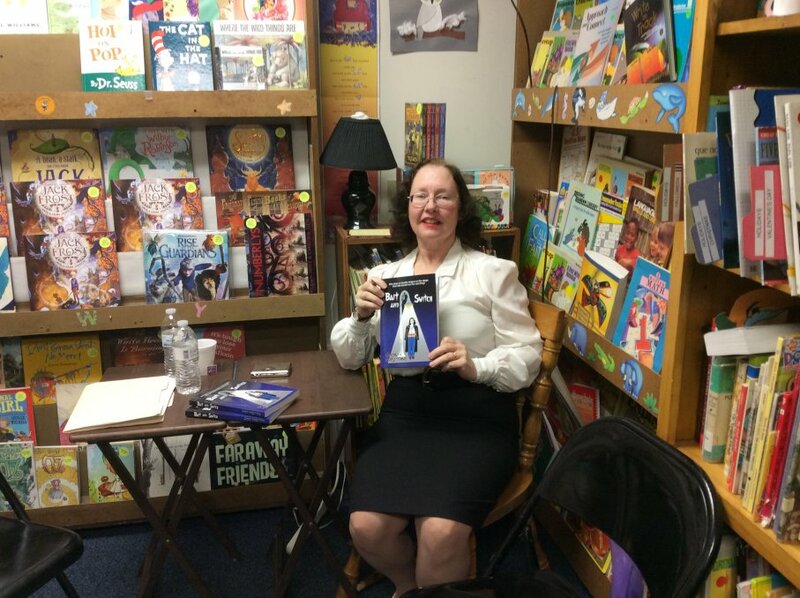 Well, after all my announcements and commotion, here, at last, is the report on my reading and signing at Annie’s Bookstop in Worcester. I HAD A BALL! What a wonderful experience. So, I will commemorate it in words and pictures for you. 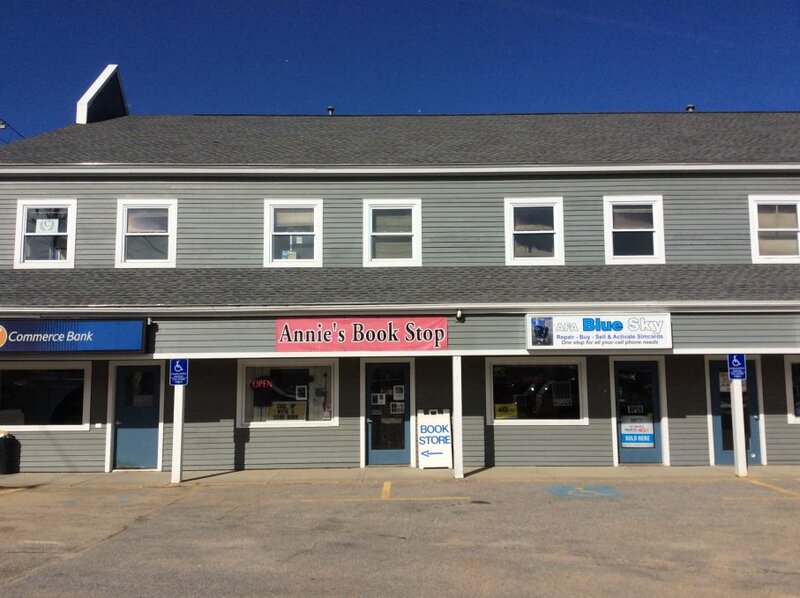 Ah, a long shot of Annie’s as viewed by the author and her entourage – aka her husband. Hey, he’s one guy but he’s worth a battalion. We all know that about Yang! Wait, here’s the heart-stopping moment where I see myself and my work celebrated in an honest-to-goodness advertisement! I’m a star! For the day. Sort of. That’s good enough for me! One of my loyal fans, Barbara Werblin greets me with gifts celebrating my great victory in actually getting the darned thing published! We’re buddies from the “Y,” so she’s seen me in my sweats and really knows me! 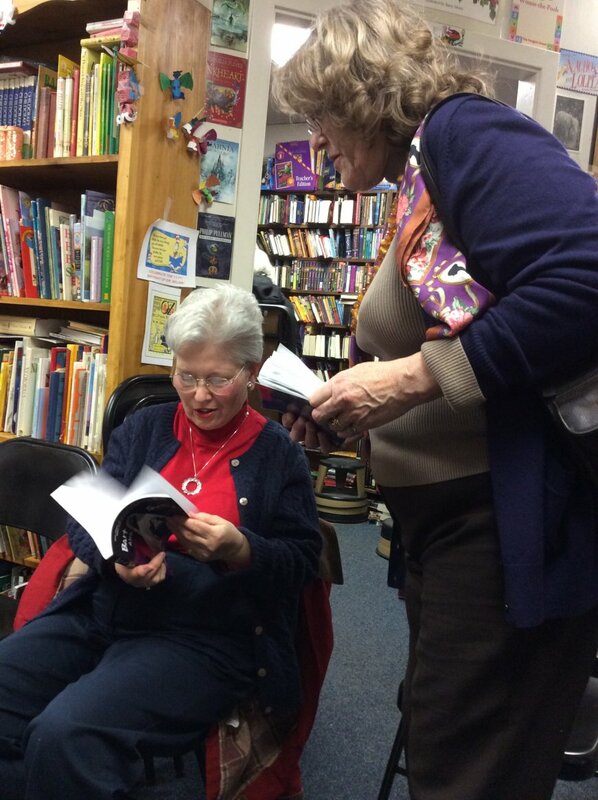 Barb’s a great friend who has given me tons of encouragement – and she loves the book, too! As the Mom of a wonderful poet, she understands the writer’s burden. Sigh! You can see my pal and colleague MaryLynn just behind me in the shot above. 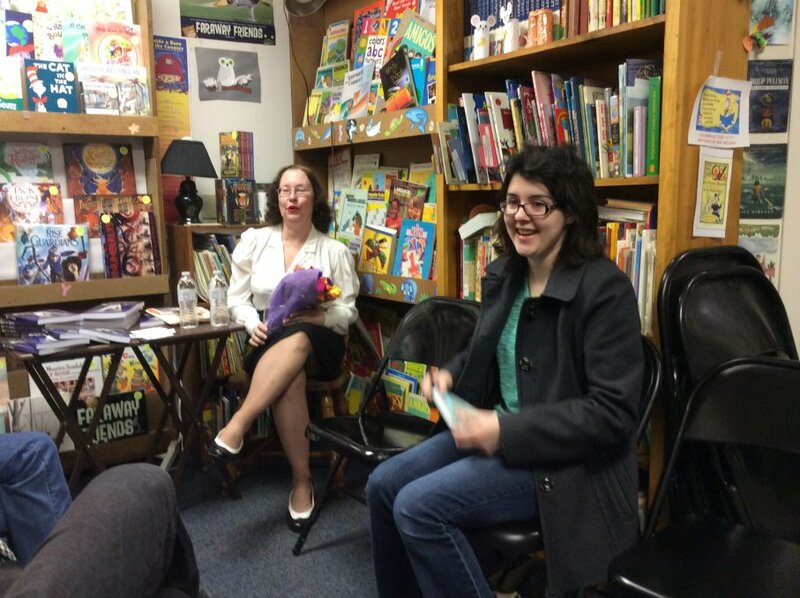 In these two pictures, you can see my friend and former student, Erin Bassler, having a good time while she reports on the event for The New Worcester Spy. (Read the article here!) 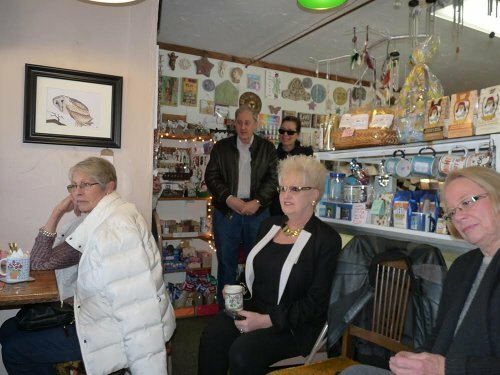 Ultimately, we had about 12 or 13 people attend, all told. I had loads of support from my friends: students, colleagues, folks I know who enjoyed Bait and Switch and like seeing me be a wise guy. 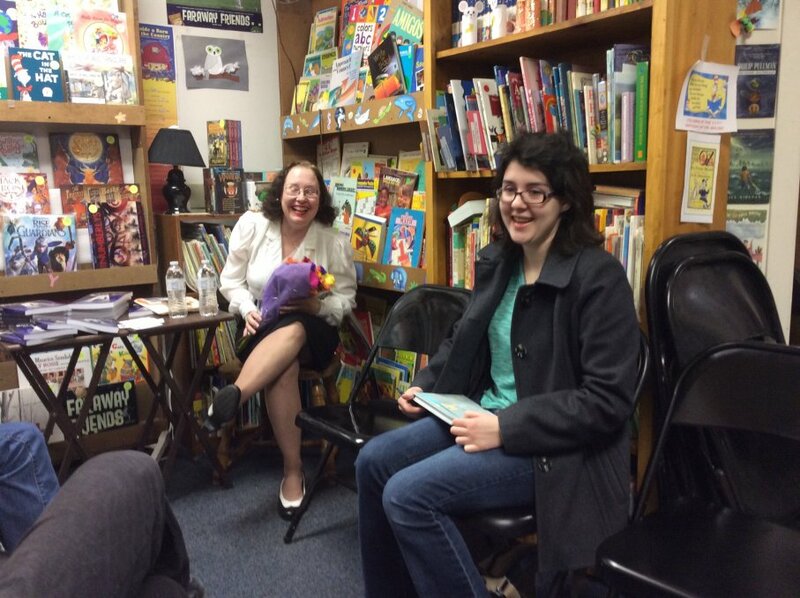 So take a gander at some of the shots from the reading, question answering, and signing. 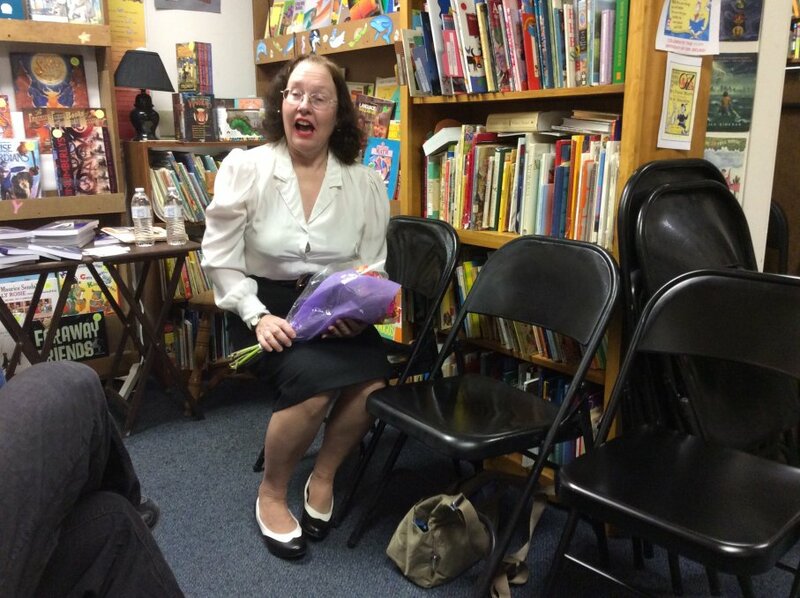 Also, note how I got myself all gussied up in my smart-talking, forties gal, film noir look: white blouse, black skirt, black and white spectator pumps, technicolor red lipstick. Agent Carter, eat out your heart! Someone said something shocking! How about those gorgeous flowers that Barbara got me for the occasion? And chocolate. She got me chocolate, too. A brilliant woman! 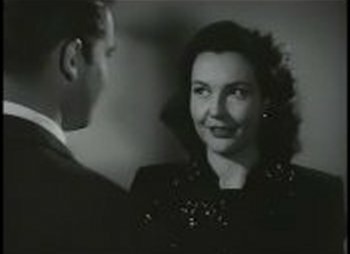 Here are some nice shots of other folks coming up with questions, pondering the noir-style mysteries engendered by James Crawford leaving Jessica Minton that mysterious package in Bait and Switch. Erin Fragola follows along intently while I ham up my reading in the background. 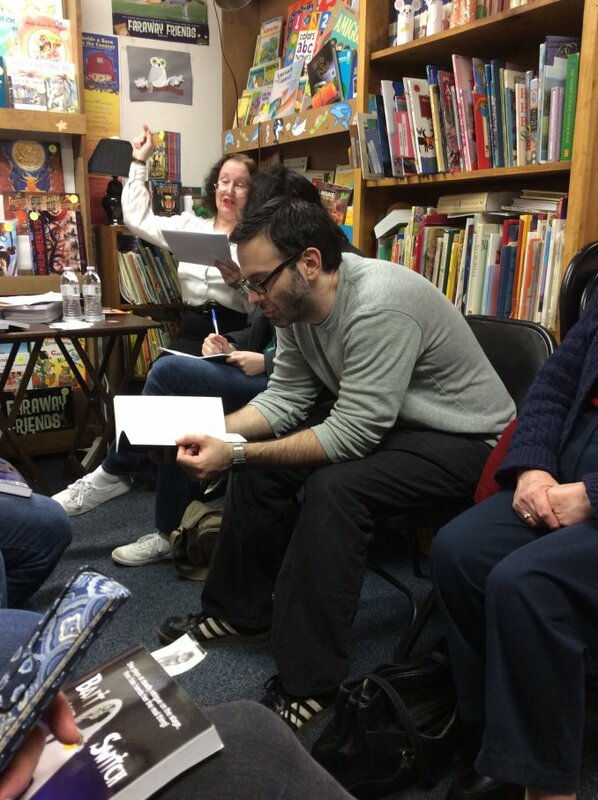 Everyone gets intense with Pam McKay concentrating to express her thoughts on one of the many exciting and intriguing questions people posed to me on the characters, plot, historical background, cinematic style of the novel, and the true identity of Dusty. Both Erin Bassler and I look perplexed. Must have been a humdinger of a query! Something to do with Nazis? 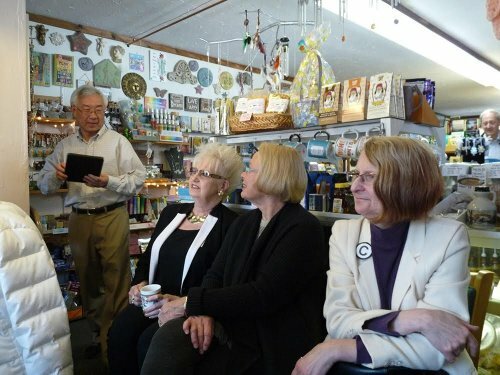 While I’m signing books for my loyal fans, Pam and her friend Gaylene are perusing Bait and Switch to throw more thought-provoking questions my way. Ah, the end of an exhilarating day! Here the author poses with her masterpiece. I could use a nice cuppa about now. Bait and Switch is the first in the series of Jessica Minton’s adventures in the 1940s. I’m not telling who else will be along for the ride in subsequent novels. You’ll have to buy the books to find out! I’m lucky to have so many friends to support me and to enjoy what I write. My only regret is that I didn’t get to include pictures of two people who made this wonderful day possible, but I do extend my heartfelt thanks. 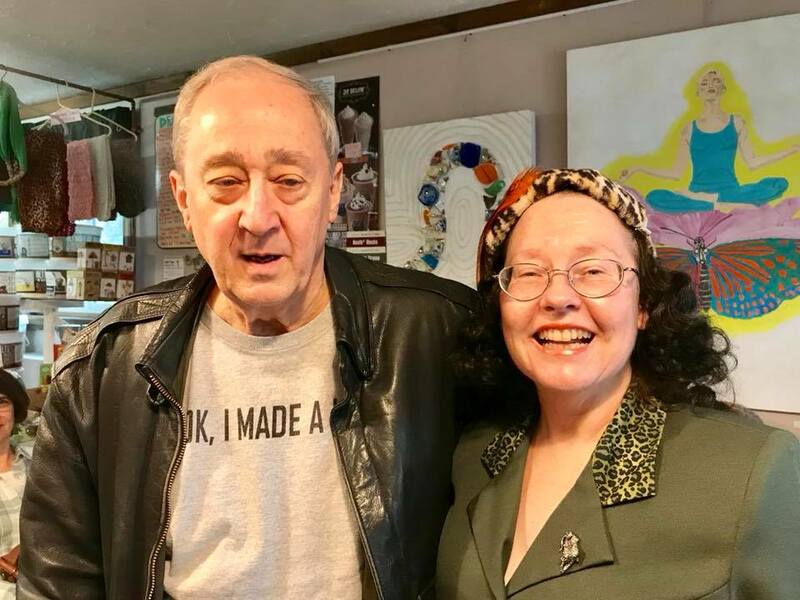 Patty at Annie’s and my husband, who always believes in me – and is lots of fun to be with – yes, I know I dangled a preposition. So there! 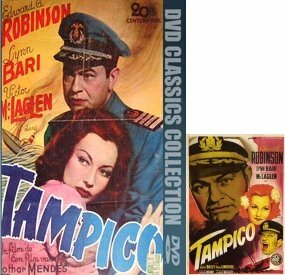 In Tampico, Bari plays a survivor of a U-boat attack whom merchant marine captain Edward G. Robinson fishes out of the South Atlantic. (Tampico)After some nifty verbal exchanges, the two fall in love and marry. All is not peaches and cream after that, as Robinson is led to suspect Lynn of being a Nazi fiver. Is she? Would those big brown eyes and apple cheeks serve de Fuhrer? Watch the movie and find out. 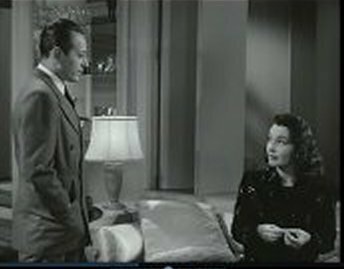 The best of her smart-talking roles, though, is as aspiring actress Frances Ransome, opposite police detective George Raft in Nocturne. Tough guy Raft is on his mettle to match her self-confidence and smooth, mordant wit. This gal is unflappable. When Raft demands of her, “Why did you kill him?” she shoots back nonchalantly, with a hint of a smile “Which one?” A pushy date tries to top off, “Gee, Baby, it’s been a swell evening,” my forcing a kiss and she deftly checks him with, “Why not let it stay that way?” followed by a gentle shove and a sarcastically sweet, “Good night.” Raft tips his hat to her prowess with a dryly admiring, “As good a block as I’ve ever seen. Ever thought of playing for the Green Bay Packers?” Bari’s Frances keeps Raft’s Detective Warne firmly in place, at one point telling him, “I have a late date. And even if I hadn’t I still wouldn’t go out [with you]. Is that clear enough for you?” Later, on the set of a movie in which she’s an extra, he tries to pull off a threatening bluff to force her to come clean about the murder. With perfect control, she cuts him dead with, “Why don’t you hop on your scooter, sonny boy, and blow. I’ve got to emote.” And she doesn’t care what people think about her as long as she knows the truth. 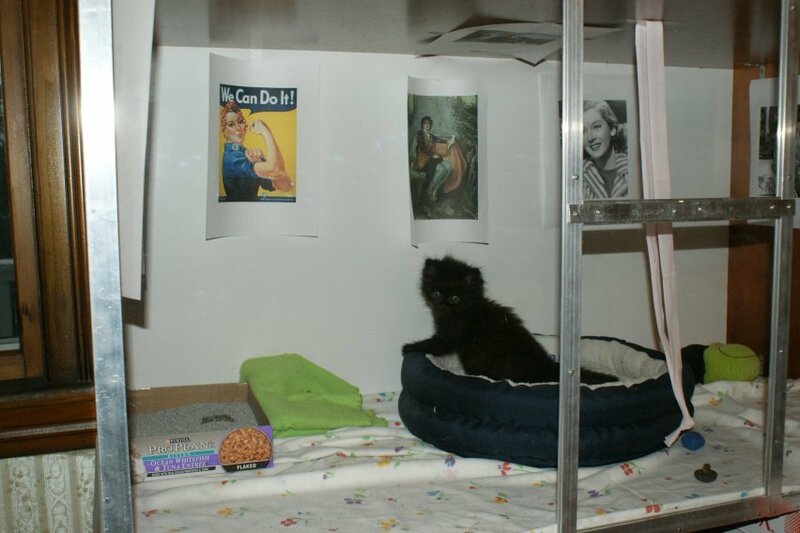 Raft tries to take her down a peg by inferring from her fancy digs and couture that he sees her as a kept woman. Instead of angrily or affrontedly protesting the truth that she’s borrowing both from a pal (hinted to be Ginger Rogers), she plays along with his misjudgment for her own amusement, responding with mock innocence, “Can I help it if people like to give me things?” Needless to say, Warne thinks she’s swell, doesn’t believe she’s the real killer, and takes the needling in stride, even fun, enjoying the challenge rather than looking for a crushing conquest. And those outfits! Especially the sequined cocktail dress – which leads to another great quip. 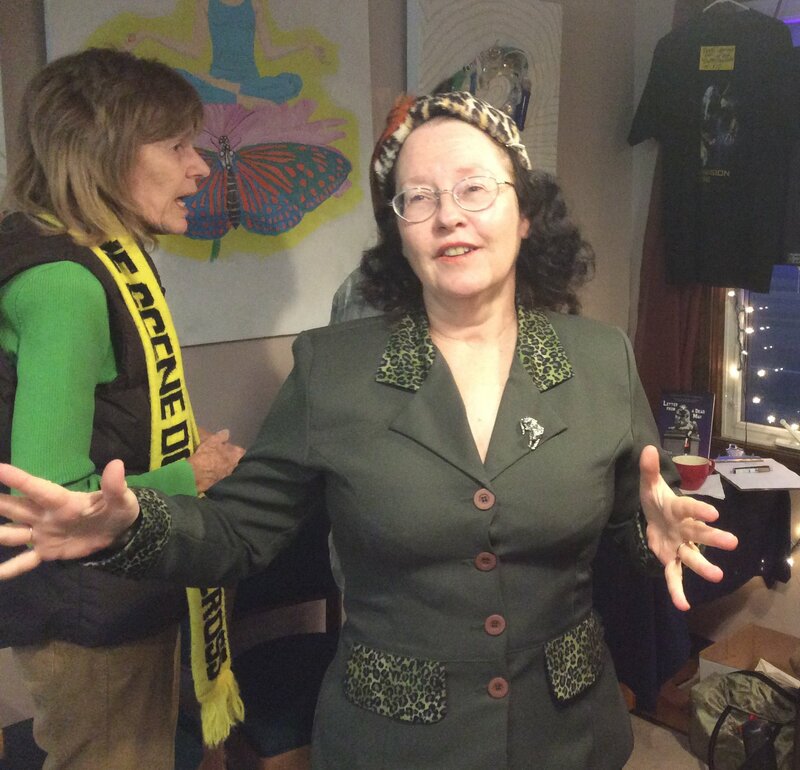 Her sister comments on liking the outfit, and Frances indirectly twits Detective Warne with, “This isn’t bad considering I ran it up on a sewing machine salesman! Still the Detective gets a kick out of, admires, her smart sauciness, her self-confidence, and the good heart he can see keeping both company. He also has a healthy respect for how she fills out a bathing suite, as well. 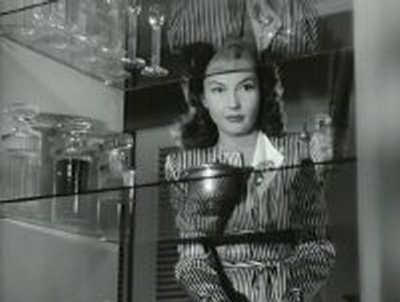 Appearances in Sleepers West and The Amazing Mr. X deserve honorable mention in the smart-talking gal category. I’d love to think up a plot for a mystery where she could be inspiration for my heroine. I’ll have to get cracking. Maybe at some point she could help out Jessica and Liz in one of my sequels to Bait and Switch? Suggestions from any Lynn Bari fans? 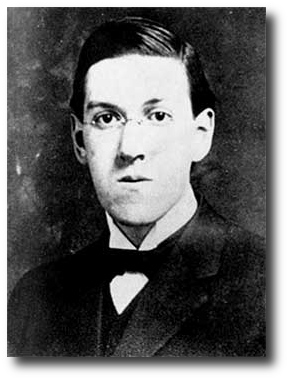 The Brattle Theatre in Cambridge, MA is celebrating the 125th birthday of Howard Phillips Lovecraft, Providence’s own native son, with a week-long film festival. They kicked things off last night with two wonderful independent productions by HPLHS (the H.P. 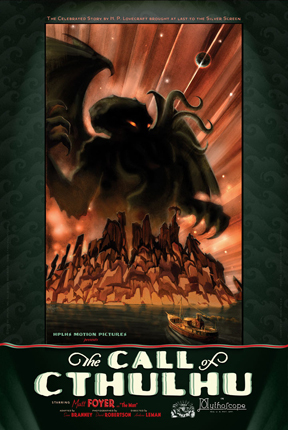 Lovecraft Historical Society), adaptations of “The Whisperer in the Darkness” and “The Call of C’Thullu.” Both are done in vintage form, the first as a 1930s Universal horror film––complete with zeppelin rather than bi-plane circling the globe for the opening card/production logo, though the zeppelin moves with far more stateliness across the screen than that buzzing aeroplane (as our boy Lovecraft would spell it). 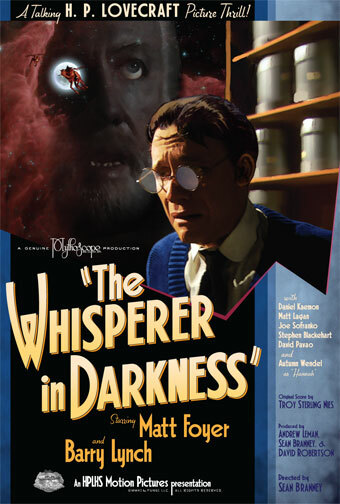 The adaptation of Whisperer was superb, with the 1930s chiaroscuro black and white cinematography creating as much eerie, unsettling mystery as the films of the earlier era, also drawing on their use of canted camera angles and under lighting to evoke a strange blend of nightmare and melancholy that was highly effective for putting the strangeness of Lovecraft on the screen. The shots of Mt. Holyoke College for Miskatonic University were delightfully Gothic. Just one thing, why do college professors in films always have offices three times what I have––or what any one I know has?The adaptation of to film was faithful to Lovecraft’s actual writing, adding on only what rounded out his tale in the proper vein of horror. I was a little confused at the ending, but I can’t say too much without giving anything away. I do not want to spoil this film for Lovecraft, old movie, or horror devotes. Also worth noting is that the concessions to modern film making only improved on the old style, with the acting untroubled by the early thirties, “I’ve just come from Broadway and I am ACTING!” that undermines so many performances until the mid and late 1930s. The use of stop motion animation and CGI together creates delightfully creepy creatures! It is such a wonderful film. Find it and watch it –– the perfect treat for Halloween. It’s available in dvd and Blu Ray at the HPLHS web site, C’thullu Lives! 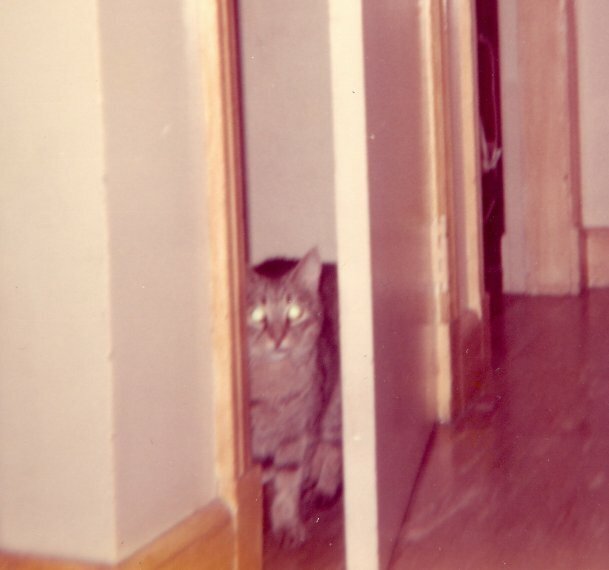 And your second feature should be none other than the same one we saw, The Call of C’thullu. Done as a silent film, this movie, uses the lighting and shadows, camera angles, sets, music, and such of silent era masterpieces like Nosferatu, The Cabinet of Dr. Caligeri, The Cat and the Canary, and Vampyr (actually partially sound) to convey the suspense, eeriness, and ambiguity of the era. Again, the acting is sound, like that of the good silent films––not over the top as people tend to stereotype all silent features. The visit to C’thullu’s island of R’lyeh was a tense and delightfully disquieting descent into horror. I vociferously applaud the HPLHS’s film making efforts and hope they keep at it. If you visit their site, you’ll also find great updates on all things (so to speak) Lovecraft, as well as Miskatonic paraphernalia and even sea shanties from Innsmouth on dvd. I’m inspired to go back and revise my own Lovecraft/film noir pastiche now! 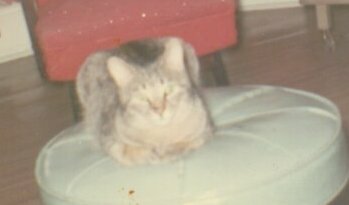 Images from “The Whisperer in the Darkness” ©2011, HPLHS, Inc., all rights reserved and “The Call of C’thullu” from ©2005, HPLHS, Inc., all rights reserved. My site is merely a fan site and no copyright infringement is intended.